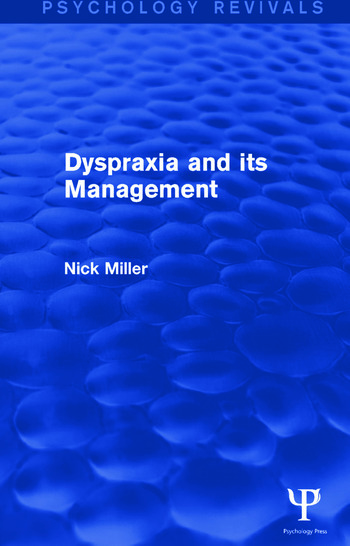 Dyspraxia is a disorder of voluntary, purposeful, learned movement and is one of the most common sequelae of stroke, head-injury, neoplasm and abnormal ageing. It is also a major complicating factor in the assessment and treatment of acquired language, visual-spatial and other movement disorders. Dyspraxics are found not only in specialist neurological units, but also in rehabilitation centres, general medical and surgical wards, geriatric units and in the community. Despite this there was little systematic discussion of dyspraxia in major texts on stroke, head injury, rehabilitation or movement disorders at the time. Originally published in 1986, one aim of this book was to correct the imbalance in the attention paid to the disorder. The emphasis of the book is practical, dealing with the recognition and assessment of dyspraxic dysfunction, and guidelines and issues in its remediation. Theoretical issues are covered in relation to their bearing on clinical management. It was the standard textbook on the topic for many years and directly relevant at the time to clinicians in the fields of clinical psychology, occupational therapy and physiotherapy, speech therapy, neurology and geriatrics. Acknowledgements. 1. Introduction 2. The Gestural Dyspraxias 3. Constructional Dyspraxia 4. Apraxia of Speech 5. Ocular-motor Dyspraxia 6. Dyspraxia-related Disturbances 7. Developmental Dyspraxia 8. Therapy. Glossary. Bibliography. Author Index. Subject Index.